ISBN 9781532016011 • Pages 1148 • $58.95, E-Book $3.99. Haitian Creole (HC) is spoken by approximately 11,000,000 persons in Haiti and in diaspora communities in the United States and throughout the Caribbean. Thus, it is of great utility to Anglophone professionals engaged in various activit ies—medical, social, educational, welfare— in these regions. As the most widely spoken and best described creole language, a knowledge of its vo cabulary is of interest and utility to scholars in a variety of disciplines. The English-Haitian Creole Bilingual Dictionary (EHCBD) aims to a ssist A nglophone users in constructing written and oral discourse in HC; it also will aid HC speakers to translate from English to their language. As the most elaborate and extensive linguistic tool available, it contains about 30,000 individual entries, many of which have mul tiple senses and include subentri es, multiword phrases or idioms. The distinguishing feature of the EHCBD is the inclusion of translated sentence- length illustrative examples that provide important information on usage. While an official orthography exists for Haitian Creole, it is important to understand that the written language is not yet fully standardized. That is, there are no extensive grammars meeting current standards of linguistic description written in the language, nor do monolingual dictionaries exist designed for native speakers of the language such as the Merriam-Webster for American English or the Grand Robert or Larousse for French. Thus, in some cases, we are not absolutely sure of the precise meaning of a Haitian Creole word or expression when we strive to provide exact equivalents of English words or phrases. However, as is the case for bilingual dictionaries that meet current standards of lexicography, such as the Diksyonè Kreyòl-Français / Français-Kreyòl, this bilingual dictionary provides an excellent starting point for the preparation of monolingual dictionaries, with specifically targeted readerships, to be used in Haiti. It is outside the scope of this dictionary to have it assume a partially encyclopedic function as it provides little information about Haitian history, culture, etc. For example, there are few proper names referring to historical personages and g eographical proper names are reduced to main cities. In the case of terms referring to Vodou, minimal information is provided to help the reader situate them within the framework of Haiti’s primary religion. 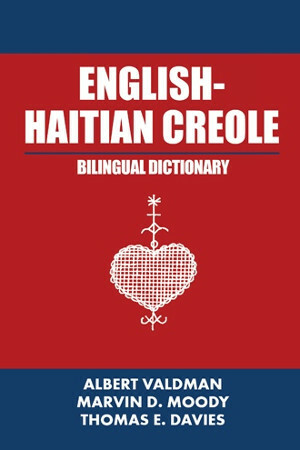 As is the case with its predecessor and companion volume the Haitian Creole-English Bilingual Dictionary, the present dictionary stands as the most thorough bilingual dictionary dealing with Haitian Creole. First, it is broader and more extensive than any existing dictio nary designed to provide Haitian Creole equivalents for English words and expressions. Its nomenclature (the list of English headwords) contains more than 30,000 entries , many of which, especially verbs, have multiple senses, and about 25,000 subentries, multiword units or idiomatic expressions whose meanings cannot readily be derived from the individual meaning of the constituent words. Second, it features the most developed microstructure (the content of individual articles) for its entries. In addition t o the headword, identification of parts of speech, and the gloss(es) (Haitian Creole equivalents), it provides abundant sentence- length English examples with Haitian Creole translations. Moreover, careful semantic analysis distinguishes between homonyms (words that share the same pronunciation but differ in meaning) and polysemes (words with several closely related senses). For the latter, senses are ordered on the basis of primarily semantic criteria, generally from a concrete or basic meaning to a more abstract or figurative meaning.